Thompson Woodworks is a father and son wood working shop in Garden City Michigan. 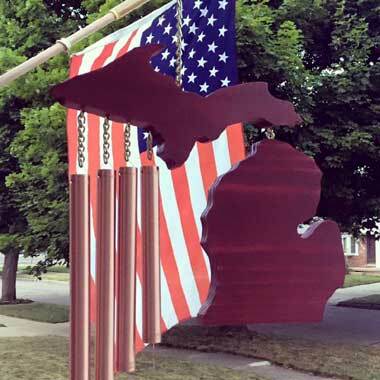 Thompson Woodworks handcrafts wood products including Michigan Wind Chimes. Not only is the Michigan Wind Chime attractive, the chimes sound beautiful. The Michigan Wind Chime is made from 3/4″ pine with two coats of Sikkens outdoor finish applied. 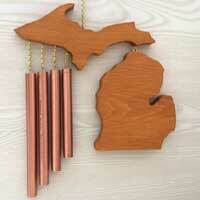 The Michigan Wind Chime has solid brass hardware along with tiger tail line for copper chimes. The copper has been sanded and sprayed with clear coat. The overall dimension of the Michigan Wind Chime is approximately 13″ tall by 11″ wide. Also available in Cedar Red. The Wind Chime looks great and is solidly put together. It looks like it should be able to withstand the elements for years. Absolutely love the craftsmanship of these wind chimes, worth the $$$!!! I purchased 2 for gifts & I’m extremely pleased w/ communication from seller & the prompt shipping!! As a supporter of local small business, I am pleased to have found these ‘Michigan’ wind chimes. They will be Christmas gifts, and I’m very happy to be giving them to my family. They are exactly what I expected; I received them in a short time. Buy Thompson Woodworks Products Here!